Posted on January 4, 2017 at 2:31 am. 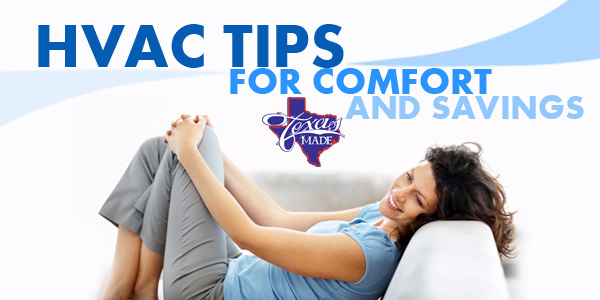 Texas Made Air Conditioning and Heating in Granbury Texas loves to help their customers be more comfortable and save money. Here are some tips to achieve both goals. Be sure to have your HVAC system checked by a professional at least once a year. This will ensure it is working properly and efficiently. This means you can have peace of mind knowing your system won’t break down. You also have ensured your power bills won’t be high because of an inefficient system that is dirty or continues to cycle on and off, working harder than it should. Replace your filter every couple of months. This helps prevent breakdowns and ensures you are breathing fresh air and not recycling pet dander and dust when your HVAC system is on. Filters are inexpensive and can be found at most hardware stores. Experiment with your thermostat settings, see if you are still comfortable when it is adjusted by a degree or two. If your comfort levels remain the same, then continue to use your new temperature settings knowing that you could be saving up to 4 percent on energy savings. Installing a thermostat that can be programmed via an app on your phone can help you save even more money. If your HVAC system is over ten to fifteen years old you may consider replacing it with a more energy efficient model that functions better, therefore saving you money and increasing your comfort. If you decide to upgrade, or have questions about what HVAC systems are on the market, give us a call at Texas Made Air Conditioning and Heating, we are more than happy to answer your questions.